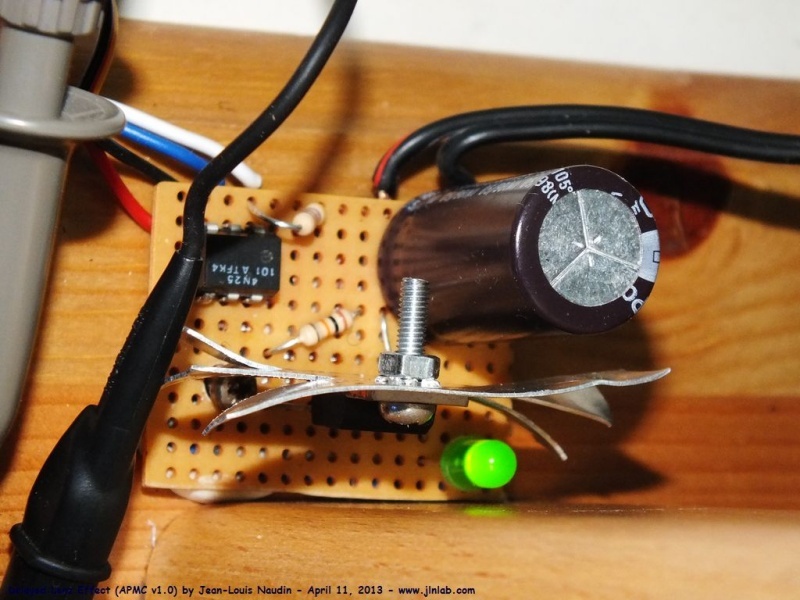 Avril 11, 2013 - DLE-TEST22 : Continuing the exploration of the Delayed Lenz Effect, I have developped a very useful tool for the fine tuning of pulsed motors such as Robert Adams or John Bedini's motors or similar pulsed motors design. 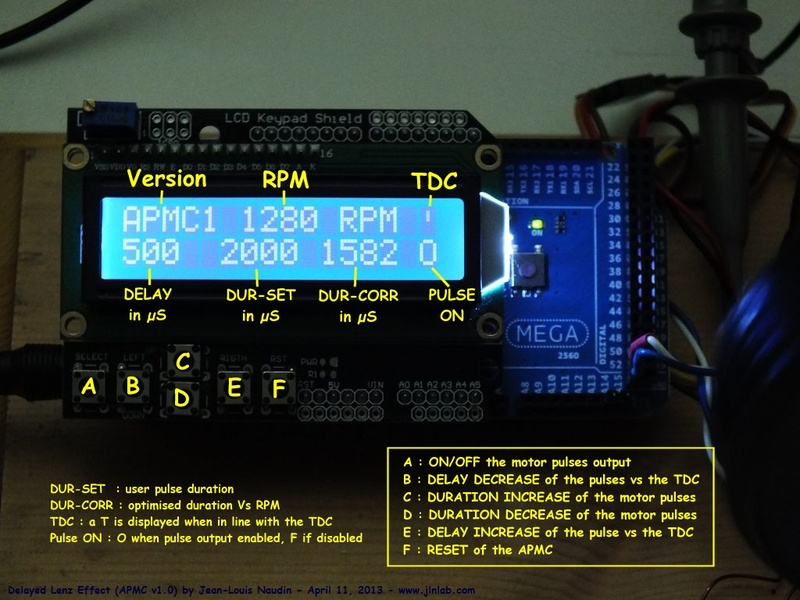 Here is the APMC v1.0 (Arduino Pulsed Motor Controller). This is a firmware that I have developped for an Arduino platform. The APMC uses a microcontroller ARDUINO MEGA 2560 board which controls (via an optocoupler) a power driver which uses a transistor MosFet BUZ11. Here, I have used an Adams or Bedini's unipolar motor (north poles outwards) and a motor coil (air core) which has an inductance of 5 mH. The rotor is equiped with 6 neodymium magnets (Bremag 27) 22 mm diameter. The APMC produces a calibrated pulse (initialy predifined by the user) on the motor coil and recomputed so as to produce an optimal torque on the tested motor. The pulse can be delayed Vs the TDC by the user. 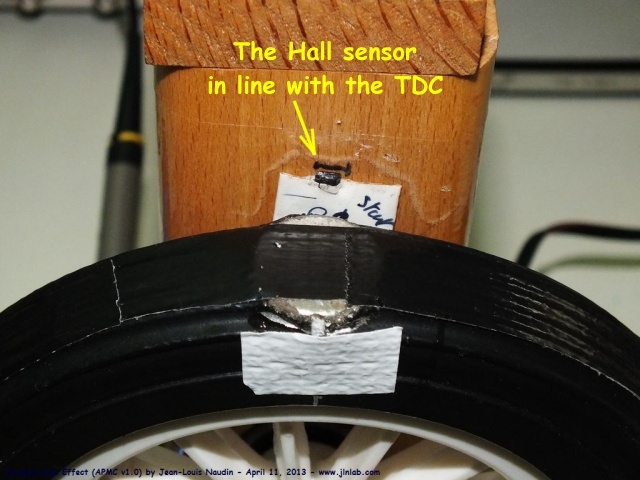 The TDC is detected by a HALL sensor TLE4935L connected on the Arduino Mega board. The datas are displayed in real time on the LCD screen (2x16), a keypad allows to select and change the control parameters of the APMC. real time full datas logging via the serial port of the Arduino Mega. but recomputed by the APMC to 1474 µS so as to optimize the power and the torque. The back light LCD allows to see all the datas in the dark. In the next article, I shall give you the full informations about the installation and the setting of the APMC firmware.